Last week I had the great pleasure of presenting on the DigiLit Leicester Project at the Digital Participation and Health Literacy Conference. This provided with me an opportunity to take another look at the process that we took as a project team over the two years, focusing more on the methodology than the digital literacy content this time. The heightened interest in digital literacy at policy level, resulting in it’s acknowledgement as a key skill alongside traditional literacy and numeracy and it’s inclusion within the Computing curriculum. The significant lack of support for teachers in translating digital literacy into classroom practice, despite this increase in interest. The building schools for the future programme. Specifically within the Leicester context, where 23 of the City secondary schools were rebuilt or refurbished by 2015, including a major investment in new technologies. The main purpose of the DigiLit Leicester project, therefore, was to support staff in making best use of the new resources available to them through BSF, and the existing tools within their classrooms. 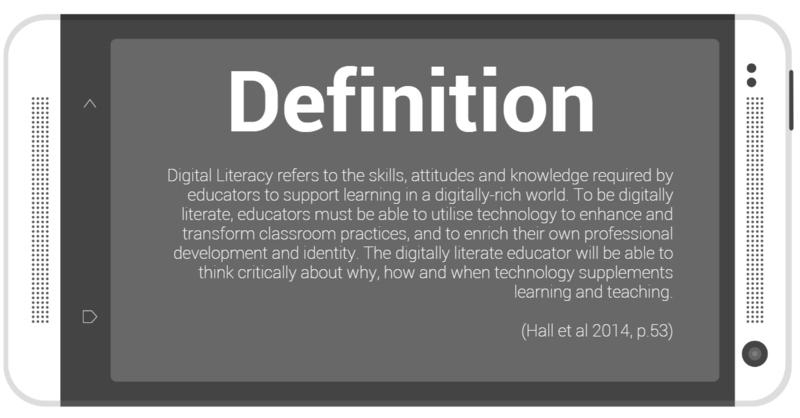 What are the key areas of digital literacy that are highlighted? How is progression through the framework structured? Are the levels explicit? Are they independent or do they build upon one another? This recognises the importance for staff: first, in developing the skills to utilise technology purposefully within the classroom; second, in critiquing the underlying knowledge and attitudes that enhance their existing practices; and third, in being positive role models for the critical use of technology. I think there are some clear similarities here between our definition and the World Health Organisation’s definition of Health Literacy, in the sense that the focus is on the creative, critical and social use of technology to meet an individual’s needs, rather than on the technological tools themselves. In order to validate the theory behind the draft framework and plans for implementation, a consultation phase was held with a number of representatives from the city’s secondary schools, as well as academics from the field of digital literacy. This helped us to refine the order of themes within the framework and to think carefully about the levels and labelling of levels within the framework. A pilot study followed, with 11 participants from 5 schools (a mix of mainstream, faith and special educational needs schools). The study was used to test out of the survey experience and its ability to reflect existing practice. Two main points for further consideration arose from this phase of the project, firstly, that the framework could not be implemented using a blanket approach – Leicester is a highly diverse City, whose schools have varying needs, and a one-size fits all implementation would be unlikely to work for all schools. Instead a locally negotiated approach would be needed. Secondly, it was clear throughout the pilot interviews that staff found the framework to be useful in highlighting new practices and tools. Often staff assumed that all practices within digital literacy would be new ones, so the framework helped to make the concept more familiar and to make staff realise that they were already working in ways that constituted as digitally literate. Based on feedback from the consultations, the framework underwent multiple iterations which added practice statements to each strand, at each level. The framework was then turned into an online survey. Due to the number of potential participants, their geographic spread across the city and our small team, it was decided that an online survey was the most convenient method of collecting data. Having the survey online also meant that school staff had the freedom to access it at a time that suited them, and the survey tool was designed to allow multiple sign ins so staff could save their progress and return to complete the survey if they needed to stop. The survey was custom built to allow for the generation of a PDF summary of the of the responses given. So for each strand a level was calculated and the participant was given an example of practice at that level, along with links to resources that could be used for professional development, should they wish to take their practice forward in this area. The survey opened with a statement of general confidence in technology use, followed by statements relating to each strand in turn. More information about the framework and survey development can be found in the initial project report on my publications page. The survey ran for the first time in 2013, with 24% of staff across the city engaging. In response to the diversity of needs across the schools, digital champions facilitated participation in schools where staff needed support. The findings of the first survey can be found in our 2013 Survey Report on my publications page. These findings were used to generate reports at both city-wide and school level, using anonymous aggregated data. Following the release of the reports, each school was visited for a 2 hour workshop, to support the school in making the best use of the data for their school-wide development. Using the findings of the survey, a number of professional development activities were organised. Six of the events were organised by the project team and focused on city-wide findings, such as the high number of staff confident in eSafety and Online identity. These Pioneers were brought together for an eSafety event to discuss how less confident staff in their schools could be supported more effectively. Alongside these events, 21 school based projects were implemented (with more since the formal end of the project). These projects focused on the needs of individuals, departments or schools, working to develop their skills in one of the strand areas. Information about the process and outcomes of each project were collated to share practice into a School Activities Report, which can be found on my publications page. The survey ran again in 2014, with 39% of staff engaging. In particular, we saw an increase in SEN school engagement. This may have been due to the focus groups that I ran with the schools during the school activities phase of the project, to investigate how the SEN and Specialist Provision schools could be supported better by the survey. The data gathered in 2014 strengthened our initial findings and also provided comparative data, through the 209 participants who retook the survey. These data allowed us to demonstrate the positive impact of the survey, with analysis showing a statistically significant change in confidence levels from 2013 to 2014. For myself personally, the DigiLit Leicester Project was a brilliant opportunity to learn valuable project management and research skills, but more importantly the project also had a number of positive outcomes for the community. All 23 schools across the city participated in at least one stage of the project. By working with schools at every stage, we developed a shared sense of ownership around the project, which lead to the schools developing their own networks and continuing the work we started once the project formally ended. Working with experts, such as ChildNet International and the University of Cambridge, to develop our resources resulted in high quality, open licensed materials that many can benefit from, not just the schools here in Leicester. The knowledge exchange element of the project support DMU in developing a digital literacy strategy of its own. Through open practices we were able to make the widest possible benefit from the survey and the projects. By sharing the processes and outputs of each we have been able to create valuable resources for other practitioners.